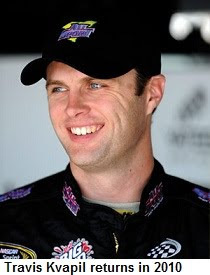 Travis Kvapil told Sirius NASCAR Radio’s Sirius Speedway with Dave Moody Wednesday that he will run the full 2010 NASCAR Sprint Cup Series schedule for Front Row Motorsports. Steven Lane will serve as crewchief on the car – expected to be the #34 – with a new manufacturer to be announced in the near future. The team ran primarily Chevrolet livery a year ago, with Dodges entered in selected events. Sources tell Sirius Speedway that former NASCAR Nationwide Series driver Kevin Conway will fill the seat of the second Front Row Motorsports entry, with sponsorship from Extenze Men's Health Supplement. Sirius Speedway has also learned that former Richard Petty Motorsports Director of Competition Mark McArdle will resurface as Director of Competition at Furniture Row Racing next season. Ryan Coniam will serve as crewchief on Smith's #78 Chevrolet, replacing Jay Guy, who left the team in late November. Coniam worked with rookie Max Papis at Germain Motorsports a year ago. Pete Rondeau, who served as Dale Earnhardt, Jr.'s crewchief in 2005, has signed on as carchief. Like a character in a bad horror movie, the Kentucky Speedway lawsuit simply will not die. Less than a week after former Kentucky Speedway Chairman Jerry Carroll said that he and his fellow former owners would abandon their four-year-old antitrust lawsuit against NASCAR and International Speedway Corporation, the Cincinnati Enquirer reports that a petition was filed yesterday in the 6th U.S. Circuit Court of Appeals in Cincinnati requesting a rehearing. Kentucky real estate developer Jerry Carroll has served as spokesman for the group from the beginning, and said after the second court ruling that he was not in favor of continuing the appeals process. Now, reports say that one of the partners has refused to drop the case. Carroll has confirmed as much, while declining to identify the partner by name. The former ownership group consists of Carroll, Churchill Downs board member Richard Duchossois, Cintas Chairman Richard Farmer, Outback Steakhouse co-founder Chris Sullivan and the estate of John Lindahl. Carroll did not immediately respond to a request to appear on today's edition of Sirius Speedway. Reporter Kevin Kelly of the Cincinnati Enquirer will join us in the opening hour of tomorrow’s show with more on the story. Sirius Speedway is a production of the Motor Racing Network; a subsidiary of International Speedway Corporation. Richard Childress Racing crewman D.J. Richardson lost his valiant battle with Acute Respiratory Distress Syndrome on Christmas Day. He was 37 years old. Richardson fell ill while visiting his home in Massachusetts over the Thanksgiving holiday, and was transported to Health Alliance Hospital in Leominster, Mass., where he was diagnosed with the H1N1 virus. A number of complications ensued, from which he was ultimately unable to recover. 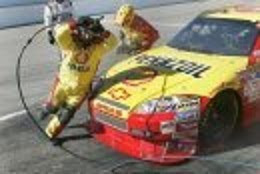 Richardson joined RCR in July 2009 and finished the NASCAR Sprint Cup Series season as the rear tire changer for Kevin Harvick's No. 29 Shell/Pennzoil Chevrolet. He began his NASCAR Sprint Cup Series career with Andy Petree Racing in 1999, and previously worked for Penske Racing, Hendrick Motorsports and Braun Racing. A viewing will be held tomorrow (12/29) at Richardson and Son Funeral Home, 106 West Street in Leominster, MA from 4-8 p.m. Funeral services will be held Wednesday (12/30) at 11 AM at St. Marks Church in Leominster. A memorial service is also being organized for his many friends in the Charlotte, NC area, with details to follow. A fund is also being set up to benefit his three children. Just when it appears that stock car racing is finally getting a bit of respect from the "stick and ball" world, someone comes along with a fresh slap in the face. On Tuesday's Mike & Mike In The Morning on ESPN2 and ESPN Radio, guest hosts Erik Kuselias and former NFL running back Merrill Hoge -- filling in for the vacationing Mike Golic and Mike Greenberg -- discussed Jimmie Johnson's selection as the 2009 Associated Press Male Athlete of the Year. Kuselias offered some interesting opinions and analysis of the selection, eventually saying that Johnson's dominance of NASCAR Sprint Cup Series racing made him worthy of being the first auto racer to be honored by the AP. The former Pittsburgh Steeler and Chicago Bear opined that “You don’t have to be an athlete to drive a car,” saying that he would have chosen Olympic sprinter Usain Bolt for the honor. “What did he do this year that makes him a better pick than Jimmie Johnson," asked Kuselias, prompting Hoge to admit that he had no idea. Told of Johnson’s claim that he could beat virtually any NFL player in a five-mile run, Hoge claimed that he could beat Johnson, despite being “chubby and in terrible shape.” Asked by Kuselias what his finishing time would be, Hoge claimed to have completed a five-mile road race recently in a time of 20:10. For the record, that breaks down to just over four minutes per mile, true Roger Bannister territory. Kuselias immediately challenged that claim, forcing Hoge to admit that it "may have been five kilometers, not five miles." For the record, five kilometers equates to approximately 3.1 miles, making Hoge considerably less formidable that he might have us believe. Still unwilling to admit defeat, Hoge promosed to call a friend during the commercial break to determine -- once and for all -- just how far he had run. Merrill Hoge is entitled to his opinion, no matter how devoid of facts he may be. The question of whether race car drivers are true athletes has been debated for years, and not many (if any) minds have been changed. 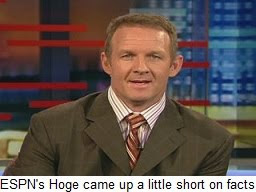 Some have made light of the fact that Hoge was forced to retire from the NFL after suffering a series of severe concussions. You can draw your own conclusions from that, if you like. The bigger question, in my view, is how "The Worldwide Leader In Sports" can offer up Hoge as a qualified sports commentator, when the man admits knowing virtually nothing about one of the country's major professional sports. If Hoge comes on the air tomorrow and says, “Basketball is a stupid sport, I know nothing about it, and I refuse to watch it,” he will likely not continue as an ESPN guest host. But the same level of willful ignorance is apparently acceptable to the powers that be at ESPN, so long as it's directed at NASCAR. Merrill Hoge is a football guy, and there's nothing wrong with that. When he sticks to his little corner of the sports world, he does an excellent job. His gridiron knowledge is second-to-none, and he deserves a spot on ESPN’s NFL and College Football roster. His sports accumen, however, seems strictly limited to football. His criticism of Jimmie Johnson’s Athlete of the Year selection is sad, if only because he readily (even joyfully) admits having no inkling of what he is talking about. ESPN can do better, whether or not they continue as one of NASCAR’s major television partners in years to come. “The Worldwide Leader In Sports” should confine Merrill Hoge to the pigskin beat from now on, where his ignorance and bias are less visible. Godfather Takes To The Flagstand At Rockingham's "Polar Bear 150"
ROCKINGHAM, North Carolina - Dave Moody, host of "SIRIUS Speedway" on SIRIUS NASCAR Radio 128 and lead turn announcer for MRN's NASCAR race broadcasts, has been named as the official starter of the Polar Bear 150 at Rockingham Speedway. Moody will wave the green flag at the New Year's Day event, officially starting the first race of 2010. 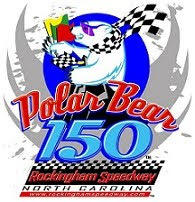 The 2nd Annual Polar Bear 150, which will be held at noon January 1, will be a chance for race fans to celebrate the beginning of the 2010 racing season with competitive racing by the Frank Kimmel Street Stock Nationals Series. The entry list, which already has 61 registrants, includes a combination of NASCAR drivers and crew members, drivers from the ARCA Racing Series presented by RE/MAX and Menards, and previous Rockingham winners from the Frank Kimmel Street Stock Nationals Series. 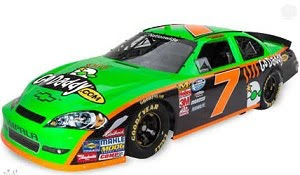 Speedway owner, Andy Hillenburg personally chose Moody to give the green for the second annual running of the race. Moody, who has been a regular on MRN Radio since 1998, is looking forward to performing his official starter duties. "The Polar Bear 150 is grassroots racing at its best, and I'm proud to be a part of it," said Moody. "I just hope I don't drop the flag." "Dave will make an awesome flag-waver for the Polar Bear 150," said Mike Calinoff, CEO of Activ8 Communications, the agency handling the PR for the event. "His arm should be in great shape from years of moving food from his plate to his mouth. Andy could not have made a better choice." The 2nd annual Polar Bear 150 kicks off on Thursday, December 31, 2009. Gates open at 8:00 AM and practice sessions take place from 1:00-1:45 PM and 3:00-3:45 PM. European-style qualifying will be held at 10:00 AM on Friday, January 1, 2010, and the green flag will drop at 12:00 PM. A driver autograph session, which will include the starting lineup as well as Moody, Firestone Indy Lights driver Leilani Münter, and some all-star surprises, will take place at the frontstretch fence between the conclusion of qualifying and driver introductions. Grandstand admission for Thursday's activities is free, and tickets for Friday are $15 in advance and $20 at the gate. Kids (12 and under) are $5. Military discounts and public suite options are both available as well. Tickets can be purchased at www.rockinghamspeedway.com or by calling (910) 205-8800. Be sure to follow Rockingham Speedway's official Twitter site, www.twitter.com/RockinghamSpeed, which will be running special contests and ticket giveaways for the duration of 2009. More information about Rockingham Speedway and the Polar Bear 150 can be found by visiting www.rockinghamspeedway.com. 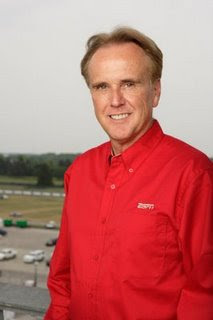 Marty Reid will replace Dr. Jerry Punch alongside booth mates Dale Jarrett and Andy Petree for ESPN’s 2010 NASCAR coverage, calling the action for all 17 of the networks NASCAR Sprint Cup races as well as many of their NASCAR Nationwide Series telecasts. Punch will return to pit road for the network’s Sprint Cup and Nationwide Series broadcasts next season, after anchoring the network’s broadcasts for the past three years. The remainder of the NASCAR on ESPN team will return next season, including analysts Rusty Wallace, Brad Daugherty, Tim Brewer and Ray Evernham, NASCAR Countdown host Allen Bestwick and pit reporters Dave Burns, Jamie Little, Mike Massaro, Shannon Spake and Vince Welch. Specific assignments and schedules will be announced later. In addition to his new NASCAR role, Reid will continue as lead booth announcer for ESPN’s five-race IndyCar Series schedule, showcased by the Indianapolis 500. Kyle Busch confirmed today that he will field a pair of Camping World Truck Series Toyotas next season under the banner of his new Kyle Busch Motorsports team. Busch will drive a partial schedule of events in a #18 Tundra sponsored by Miccosukee Resorts, while sophomore driver Tayler Malsam will drive a #56 Toyota with sponsorship from Talking Rain and ActivWater. Former Camping World East and West Series driver Brian Ickler will drive the #18 Miccosukee Toyota in the races that Busch does not run. KBM will utilize chassis, parts, technology and some personel from Joe Gibbs Racing. The team will operate out of the former Xpress Motorsports building for now, until Busch's new, state-of-the-art facility in Mooresville, NC is completed early next year. There was no announcement today of a ride for veteran Johnny Benson, but Benson was in attendance at the press conference, and Busch said he hopes to field a third entry for him this season if sponsorship can be found. "We've had a lot of great discussions with folks, but nothing has progressed tot he point where we could announce it today," said Busch. "It means a lot to have Johnny as part of this team, and we hope to be able to run him in a full championship effort this season." Sirius Speedway reported earlier this week that talks are underway with Exide Batteries and at least one other sponsor about backing Benson. The latest – and possibly final -- round in a federal antitrust lawsuit filed by the former owners of Kentucky Speedway has gone in favor of NASCAR and International Speedway Corporation. Earlier, a federal appeals court rejected claims by former Kentucky owner Jerry Carroll and his associates that NASCAR violated antitrust laws by denying it a spot on the NASCAR Sprint Cup Series schedule. The United States 6th Circuit Court of Appeals ruled that the speedway failed to prove NASCAR and ISC colluded to keep Kentucky off the schedule; echoing an earlier ruling by a lower court. Today’s verdict could bring an end to a case that was originally filed in 2005, and has cost both sides millions of dollars to argue. Carroll and company do have an option for additional appeal, however, and based on their previous unwillingness to take "no" for an answer, the case could indeed live on. NASCAR spokesman Ramsey Poston commented on the ruling today, saying, "NASCAR is pleased with the court’s ruling, which supports our case, that like other sports such as the NFL, MLB and the NBA, NASCAR can host its events where it decides is best for the sport and its fans. Spokespersons for Kentucky Speedway declined to comment on the ruling, preferring to wait until a decision is made by the track's former owners on possible further appeals. Attempts to contact Carroll for comment have not yet been successful. International Speedway Corporation is the parent company of MRN Radio, which produces Sirius Speedway. 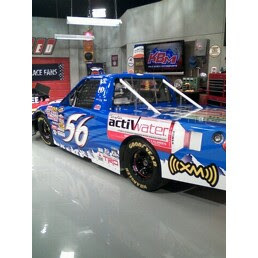 Ted Musgrave told Sirius Speedway Wednesday that he has an opportunity to replace Kyle Busch in the driver’s seat of the #51 Billy Ballew Motorsports Camping World Truck Series Toyota next season, if adequate sponsorship can be found. Busch is expected to announce details of his new Kyle Busch Motorsports team on Friday, and sources tell Sirius Speedway that another former Truck Series champion, Johnny Benson, will be featured prominently in that announcement. Officials of KBM reportedly met with representatives of Exide Batteries last week about sponsoring one of three planned Toyota Tundras to be fielded by the team. 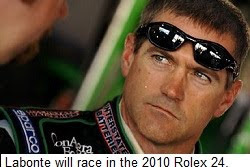 Bobby Labonte took part in yesterday's Grand-Am Rolex Series test at Daytona International Speedway, driving a Porsche for his NASCAR Sprint Cup Series team TRG Motorsports. The 2000 Cup champion said he plans to compete for the team in the Rolex 24 at Daytona; his fourth career start in the legendary sportscar event. "Kevin (Buckler) really didn't have to talk me into it," said Labonte yesterday. "I've always been a big fan of the Rolex 24 since I started racing, and I raced a go-kart on the same track when I was 15. He didn't have to twist my arm." Labonte will team with co-drivers Andy Lally, Spencer Pumpelly and Tim George Jr. at the wheel of the defending GT-class winning #67 TRG Porsche GT3. Wallace Still Searching: Despite statements to the contrary, it appears that Kenny Wallace may not be as well-off in terms of 2010 sponsorship as initially believed. 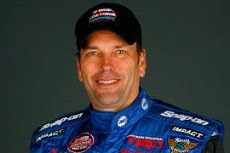 Wallace told Sirius Speedway recently that he will run full-time for the Jay Robinson Racing #28 NASCAR Nationwide Series team again next season, that negotiations were progressing for the US Border Patrol to return as a major sponsor, and that a new "high end" backer was set to be announced for an additional eight races. Today, the team released a statement saying that they do not have a deal for 2010, and that there are no contracts signed. The statement said, “We would love to have Kenny back for the full schedule. However, this will not happen unless sponsorship can be found. At this point, we believe at least eight races could be possible. Beyond that, all options are open." In other Wallace news, Chrissy Wallace said this week that she hopes to run at least the first five races of the NASCAR Camping World Truck Series season, and is working on sponsorship to make that happen. Wallace also said there is a chance that she could run a pair of Nationwide events, as well, pending sponsorship. She was slated to run the full Truck schedule a year ago, but a planned sponsor withdrew just before the season, forcing her to the sidelines for all but a couple of races. After months of flirtation, Danica Patrick is finally ready commit – on a limited basis – to NASCAR. The IndyCar Series star announced today in Phoenix that she will run a limited schedule of NASCAR Nationwide Series and ARCA races next season for JR Motorsports, ending months of speculation about her future. Her exact 2010 stock car schedule was not announced today; only that she will take her first laps in a full-fendered racer in a three-day ARCA test at Daytona International Speedway December 18-20. Assuming that NASCAR officials like what they see in that test, Patrick would then be approved for competition in the 2010 ARCA opener during SpeedWeek, and presumably for the NASCAR Nationwide Series lid-lifter on February 13. The remainder of Patrick’s stock car slate will be arranged with an eye toward the IndyCar Series schedule, which remain her top priority. Patrick recently sign a new, two-year contract with the Andretti Autosport IndyCar team, with an option for a third. Both Patrick’s NASCAR and Indy efforts will be sponsored by GoDaddy.com, which will also back Mark Martin’s Hendrick Motorsports Sprint Cup entry on a limited basis next season. Sources at JR Motorsports say a pair of ARCA-legal Chevrolets are near completion in the team’s Mooresville, NC shop, with crewchief Tony Eury, Jr., overseeing the operation. Co-owner Dale Earnhardt, Jr., said last week that he hopes to field two full-time Nationwide Series entries next year, but that sponsorship for both cars is lacking. Kelly Bires’ #88 Chevrolet currently is sponsored for only half the races in 2010, with the #5 – renumbered #7 for Patrick to match her IndyCar livery – has only four sponsored races beyond Patrick’s limited schedule. Randolph To TRG: Doug Randolph will replace Slugger Labbe as crewchief for Bobby Labonte and the #71 Sprint Cup Series team at TRG Motorsports. Randolph most recently served as crewchief for the #07 Richard Childress Racing Chevrolet, and will rejoin Labonte, who he crewchiefed for at Petty Enterprises in 2007. Labbe parted company with TRG late last week to accept a new position with the newly merged Richard Petty Motorsports/Yates Racing operation as crewchief for Paul Menard. He began work there yesterday, but the team has still not officially announced his hiring.